Bring a tropical flair to your dining room with this rectangular dining table. Crafted from a rattan wood frame and leather bindings, this dining table has a gorgeous sandalwood finish. 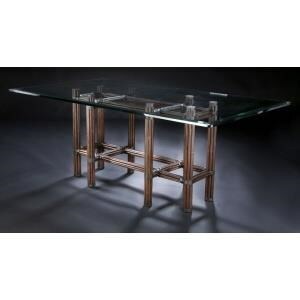 Completed with an elegant tempered glass table top, this dining table is sure to give your dining room a tropical feel. The Sumatra III Sable 84" Dining Table by C.S. Wo & Sons at C. S. Wo & Sons Hawaii in the Hawaii, Honolulu, Oahu, Hawaiian Islands, Waikiki, Diamond Head, East Honolulu area. Product availability may vary. Contact us for the most current availability on this product.